Captain Howell Davis (ca. 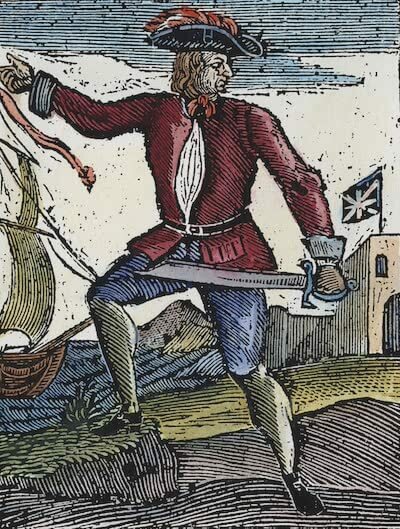 1690 – 19 June 1719) was a Welsh pirate best known for starting the career of the infamous Bartholomew Roberts. While his career was exceptionally short for a pirate, his story is no less interesting. Davis was known for capturing at least fifteen known ships during his lifetime. Born in Milford Haven, Pembrokeshire, Wales, Davis first started his piracy career on July 11th, 1718. Before becoming a pirate, Davis was a mate aboard a slaving ship named Cadogan. When the ship was captured by Edward England he was conscripted into joining their crew. However he said he would rather die than sign the pirate articles which impressed England so much he gave Davis command of the ship. 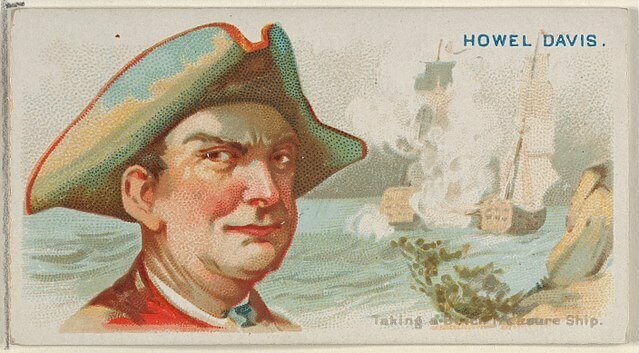 With Davis in command of the Cadogan he and the crew set out for Brazil on July 18th, 1718 in order to sell the ship. However en-route his new crew mutinied against him and he found himself imprisoned on Barbados with charges of piracy. Eventually he was released within three months and he set sail for Nassau on New Providence Island in the British controlled Bahamas in order to recruit a pirate crew from the fabled pirate haven. However Nassau was under occupation by Woodes Rogers and there were no pirates to be found there to assist him. From Nassau, Davis left aboard a sloop named Buck. While traveling, Davis and six crew members including Thomas Anstis and Walter Kennedy mutinied and overthrew the captain of Buck near the coast of Martinique. Davis was elected captain of the new ship and they set up their base at Coxon's Hole. Davis was one of the few pirates that ventured out of the West Indies in order to continue pirating. Traveling as far away as the Cape Verde Islands off the coast of Africa, Davis captured a ship named the Saint James. The Saint James was a 26 cannon ship that Davis made his flagship after its capture. Next Davis must have met up with Edward England again as he tried to form a partnership with the French pirate Olivier Levasseur and another pirate Thomas Cocklyn. One time while they were partners, Davis and Cocklyn seized a ship named Bird captained by William Snelgrave. When seeing the abuse of Snelgrave at the hands of Cocklyn's men, Davis took it upon himself to protect the captain. This made a favorable impression on the captain who documented the incident later for the authorities. After a while, the partnership between the pirates did not last and they fell out after a drunken confrontation. Transferring onto a 32-gun ship named the Rover, Davis and his crew sailed south and captured many ships off the Gold Coast of Africa. Davis often conscripted crew members from captured ships to join his crew, and one ship in particular would contain Bartholomew Roberts who Davis forced to join his crew. Roberts however, was destined to become much more famous than his teacher in the later years of the 1720's. Next, Davis ventured to the Royal African Company slaving fort in Gambia. Here he pretended to be a legitimate merchant and privateer looking to buy slaves. Once he gained the confidence of the fort commander he and the crew was invited to a welcoming dinner. Once at the dinner, Davis pulled a pistol on the commander and his men captured the fort without a shot fired. Davis and the pirates then locked up all the soldiers, drank all of the rum and fired off the forts cannons for fun. They then ransomed the commander and made off with nearly £2,000. A while later they seized a French ship by flying a pirate flag high above a large but under-equipped ship, forcing the more heavily armed French ship to surrender thinking it was outmatched. Davis was known for his ingenuity and his remarkable pirating skills. Davis tried one of his boldest moves yet on the Portuguese island of Principe. Davis and his crew pretended to be Royal Navy pirate hunters in order to trick their way into kidnapping and ransoming the governor of the island. However, the governor was informed of their plan and set up an ambush of his own. As Davis was invited to call at the governor's fort for wine, the pirates were ambushed and killed on June 19th, 1719. In the aftermath of Davis death in the Portuguese governors mansion, Bartholomew Roberts was elected captain. He proceeded to return to the island later that night and slaughtered most of the male population, as well as looting the city itself. This assault marks one of the few times pirates in the 18th century actually went on land to kill, maim and plunder, however this was more of revenge than anything else. 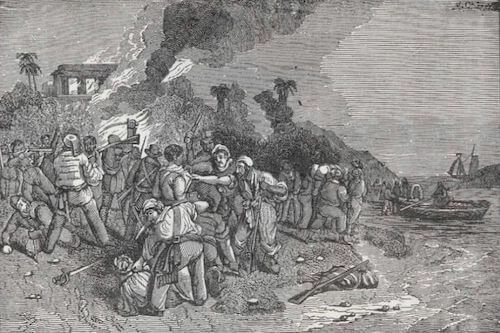 Satisfied with avenging Davis' death, Roberts and the crew continued on plundering.